Worlds Worst Blaahhg: Have I done a hutch yet? In case anybody went over to the Top Shelf Comix website looking for my comics that were to debut, and thought I was a dirty liar cause they couldn't find them - fear not. The color version of Burning Building 3 is set to be on the website, just not quite yet. Apparently, they're looking at putting Issue 1 back up first and then issue 3 some time after that. They're putting up new comix every weekday, so it shouldn't be long. Issue 1, once again in full color, is supposed to be up this Thursday. Lately, I've been working on a bunch of in-between things, mostly the inside covers for Burning Building 3, which I delayed doing due to a convention, and for Burning Building 4. I usually like to do these right after I'm done with the guts of the book, put doing a pair of them back to back was a bit rough. 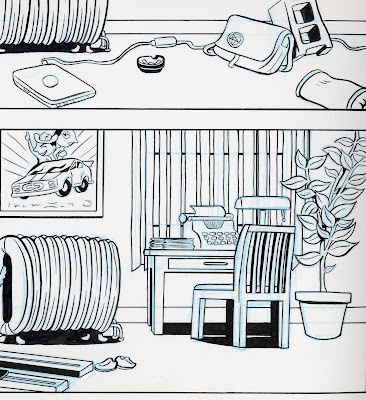 The inside covers are just backgrounds, with the character's furniture and knick knacks lying around to give people a sense of what the character is like. Well, it's pretty damn boring to just draw backgrounds (don't know how Gerhard did it), and even more boring when it's a bunch of furniture that has to be different from the six other apartments I've already done. I spend way too much time thinking up ottomans and lamps! Here's a peek at one of the covers. I scanned it as a color photo so you can see the blue line pencils underneath the black ink. Here's a picture of Van in a box. It illustrates well his obsession with cars, and anything with freakin' wheels. And now the three song ipod shuffle. I love Liz Phair, a Chicago gal, and Turning Japanese is a good cover. It's true to the original, but it has enough of her own sound to be different and fresh. Moby I'm pretty luke warm on, but I do like South Side, especially being a White Sox fan. I got pretty F'd out on a lot of Oasis, cause I used to work with a guy at the Comix Revolution who would play them non-stop. I am a bit a of brit pop fanatic though, although Oasis got way too bloated and way too high on cocaine!